Tsai Ing-wen radiates a calm that sheathes a core of inner steel. The winner, looks much different, not to us alone – to her close neighbours as well. Today, every newspaper you will get to read about the return of didi and beating odds by Ms Jayalalithaa – this is a story happening miles away. Before plunging into politicis, the +2 results of TN State board were announced recently. There has been a slight improvement in the pass percentage, with a statewide percentage of 91.4, as against 90.6 percent registered in the previous two years. As the results began to come in on Tuesday morning, it became clear that students from less-known towns and villages had done well, putting those from cities and big towns in the shade.With a total of 1195, two students, Aarthi and Jaswanth, from Vidya Mandir school in Oothangarai, Krishnagiri district, secured the State first rank. Pavithra G. from Tiruvallur and Velupreetha from Namakkal came second and third with a total of 1194 and 1193, respectively. In the examinations held in March this year, 8.3 lakh students appeared across the State, the pass percentage of girls was 94.4 and that of boys, 87.9. The number of centums in Physics fell drastically from 124 the previous year to five. Similarly, in Mathematics too, the number of centums dropped from 9,710 to 3,361 this year. With 4,341 students, accountancy accounted for the most number of students scoring a centum in a subject, this year. For those in Science stream, aspiring to becoming Engineering – Anna University is the gateway. Anna University Counselling Engineering Application Forms 2016 will be available only through online mode this year. The online application process started from April 15, 2016. Last date to register online is May 24, 2016. TNEA 2016 counselling is a single window counselling conducted by the Anna University on behalf of the Government of Tamilnadu to the benefit of the engineering aspirants to get seats in the engineering colleges in Tamilnadu on merit. The seats will be allotted based on the cutoff marks and the social equality quota prescribed by the Government of Tamilnadu. Colleges such as Government engineering colleges, Private engineering colleges, Government aided engineering colleges affiliated to Anna University participates in this counselling. Last year the scenario was different. People could apply through both online and postal method. But this year the whole application process system has been changed to online. The counselling will be held at the Examination Centre, Anna University Chennai, Chennai - 600 025. According to TNEA, Candidates will be called for counselling in the order of their merit. Based on the merit and communal reservation, allotment to the branch/college chosen by the candidate will be made. Candidates have to opt for colleges and branches that are available at the time of counselling. Although politics and the movie world are well connected in Tamil Nadu, film action heroes appear to have lost out this time around in the state assembly polls. The actor-turned-politician leader of All India Samathuva Makkal Katchi R. Sarathkumar lost in Tiruchendur constituency against his DMK rival Anitha R. Radhakrishnan. At Ulundurpettai, Captain, DMDK leader A. Vijaykant came in third polling 26,950 votes and trailing far behind the candidates from AIADMK (63,906 votes) and DMK (57,850 votes). Away, Canadian Prime Minister Justin Trudeau, under fire for getting involved in an unprecedented physical fracas in Parliament, said that he was only human and in a high pressure job but promised there would be no repeat of his actions. Trudeau, impatient at what he saw as stalling tactics by the opposition ahead of a vote on Wednesday evening, crossed the floor in the House of Commons to grab one legislator and drag him to his seat, accidentally elbowing another in the chest. He has apologized three times already and said he would accept any punishment meted out by a special committee of legislators examining the incident. "But I think at the same time, a big part of recognizing strengths and weaknesses is when you make a mistake you admit it, you make amends, you ask for forgiveness and you make sure it never happens again." Now back to Tsai – when Taiwan’s new president takes the oath of office this week, two vital constituencies—one at home, the other across the strait in mainland China—will be listening hard, but for different things. 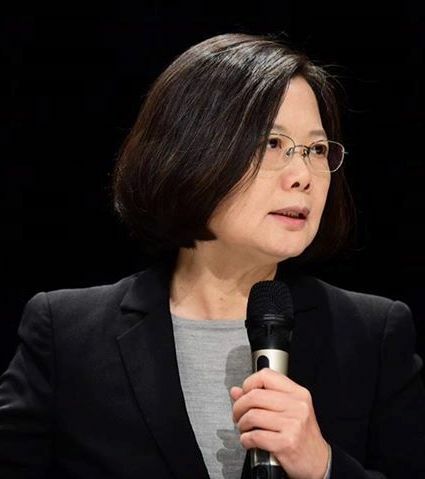 She heads a political party nominally in favor of Taiwan’s independence from China, a red line for Beijing that would formalize a split from a stalemated civil war more than six decades ago. At Friday’s inauguration, she is expected to reiterate her campaign pledge to maintain the status quo, even though many voters who propelled her to a landslide election victory want her to check China’s growing sway over the island. Bad relations between Taipei and Beijing can exact a toll on the island’s economy. Tensions also threaten to enmesh the U.S., which by law is supposed to help Taiwan maintain its defense capability and whose credibility in the region could be at risk if it abandons the democratic island to pressure from China. Taiwan’s departing president, Ma Ying-jeou of the Nationalist Party, managed to keep relations with China on an even keel. Tsai's Democratic Progressive Party (DPP) won parliamentary and presidential elections by a landslide in January on voter backlash against creeping dependence on China. There were massive protests in 2014 against a trade pact with China that the previous government had sought to push through. The DPP, which has traditionally favoured independence from China, takes over after eight years under China-friendly Nationalist Ma Ying-jeou. Tsai's inauguration speech at 11.10 am (0310 GMT) will be widely watched for any hint of anti-China sentiment, which could sour economic ties further. ‘Buddha in a Traffic Jam’ is an autobiographical film based on its writer and director Vivek Agnihotri's life. The film is about a subject that is fiercely topical - the alleged links between India's premier educational institutions with militant ultra-leftist movements and organisations. It has had its detractors and supporters already – in the end, it is only a film, a commercial one at that ! !